The 17th International Conference on Diseases of Fish and Shellfish organized by the European Association of Fish Pathologists is a 2015 key event for the scientific community (researchers, veterinarians, etc) related with pathologies of major taxa of marine organisms. iii. extend the potential of research efforts on biology and welfare of cephalopods. 3. a WG2 satellite meeting (September 11). During the meeting we plan to discuss approaches, strategies and possible collaborations for the achievement of important deliverables, and results of FA1301 WG2 and WG4. The participation of selected members of WG1, WG4 and WG5 will be also facilitated. 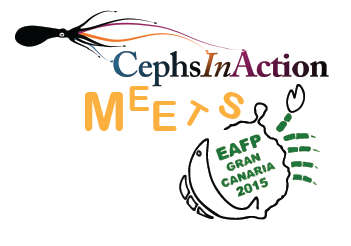 See more info at ‘WG2 CephsInAction meets EAFP’ page!